For testing, I grabbed a bunch of the hardware I had around and gathered one set of numbers: average throughput copying a single large file from my desktop with a wired Gigabit Ethernet connection to a laptop. I’m using Western Digital’s MyNet AC1300 router as the wireless router. The AC1300 is running firmware v1.03.09, and it's a product that has now been around for eight or so months. It supports up to 450Mbps (3x3:3 MIMO) on 802.11n connections and up to 1300Mbps on 5GHz 11ac connections. (Unfortunately, I didn't ever seem to connect with more than two 11ac streams with my current hardware, including Western Digital's AC Bridge.) We’re still not at Gigabit Ethernet speeds in most cases, but with nearly triple the throughput of the fastest 11n wireless it’s definitely getting closer. For the adapters, I tested both single- and dual-band offerings. On the 802.11ac side, I used an 11ac bridge (the Western Digital My Net AC Bridge), a USB 11ac adapter (Linksys AE6000), and a Clevo P157SM notebook from Mythlogic (Pollux 1613) equipped with Intel’s latest Wireless-AC 7260 adapter. I should take a minute to note that one of the great things about going with a boutique laptop vendor like Mythlogic is the ability to customize not just the storage and CPU, but the WiFi adapter as well. Then I tossed in three other laptops, two of which I’m working on reviewing along with a previously reviewed laptop. 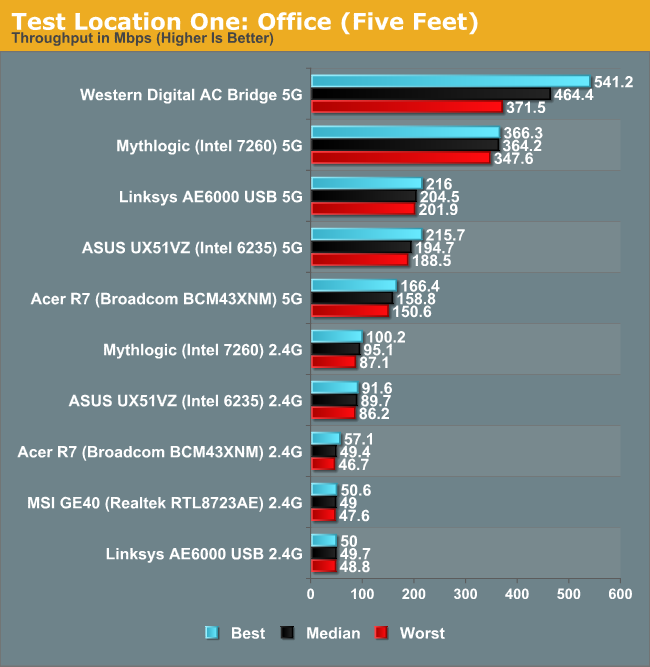 The ASUS UX51VZ uses Intel’s common Wireless-N 6235 adapter (dual-band 2x2:2 MIMO with Bluetooth 4.0), Acer’s Aspire R7-571-6468 “oversized hybrid” uses a Broadcom BCM43XNM chipset (based on the hardware ID, it appears to be the BCM943228HM4L, or at least something similar—it’s also dual-band 2x2:2 MIMO with Bluetooth 4.0 support), and the MSI GE40 is the lone 2.4GHz single-band 150Mbps offering sporting a Realtek RTL8723AE chipset. All of the adapters were tested in both 2.4GHz and 5GHz modes (where applicable). And with that said, here are the results from two test locations. Location one is with the target device in the same room as the router (my office), about five feet away. The second location is downstairs at the home theater area (my “second office”), about 20 feet away with one wall and one floor in between. The results show minimum, median, and maximum throughput of five test runs, with the caveat that I made sure there were no outliers—sometimes Windows or WiFi will have a really slow run or two. 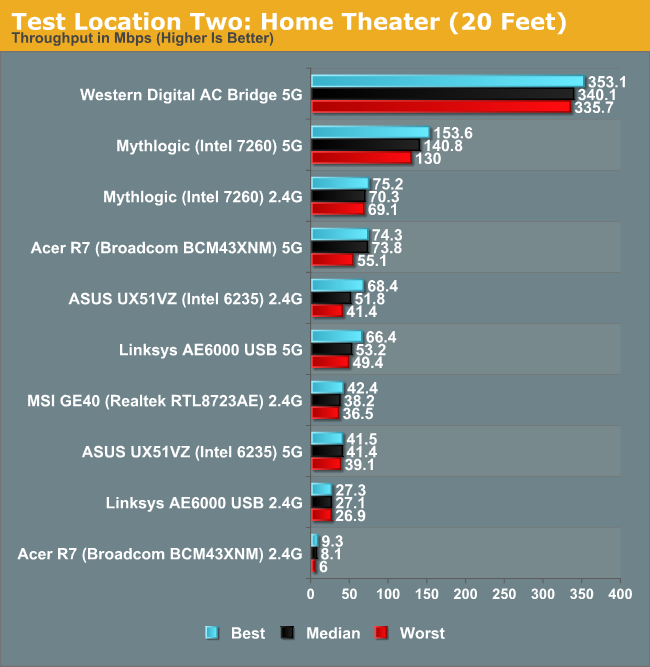 Not surprisingly, the AC Bridge posts the best performance of all the solutions. With three spatial streams, I was hoping to get a lot closer to 800-900Mbps of throughput, but most of the time it appears to have run at closer to two streams. 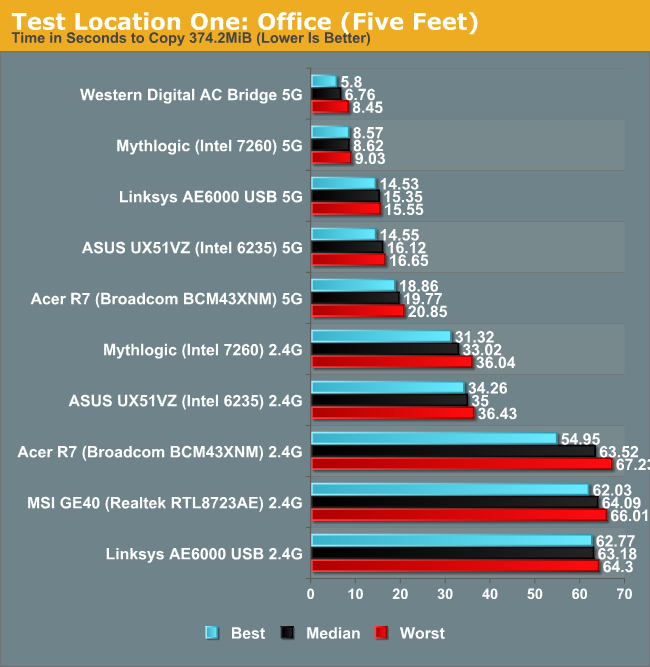 Performance isn't all that different from the Mythlogic laptop with Intel’s 7260 AC adapter at the short range location, but it’s over twice the speed at the second test location. What’s even worse is how poorly many of the solutions end up performing at the second test location. 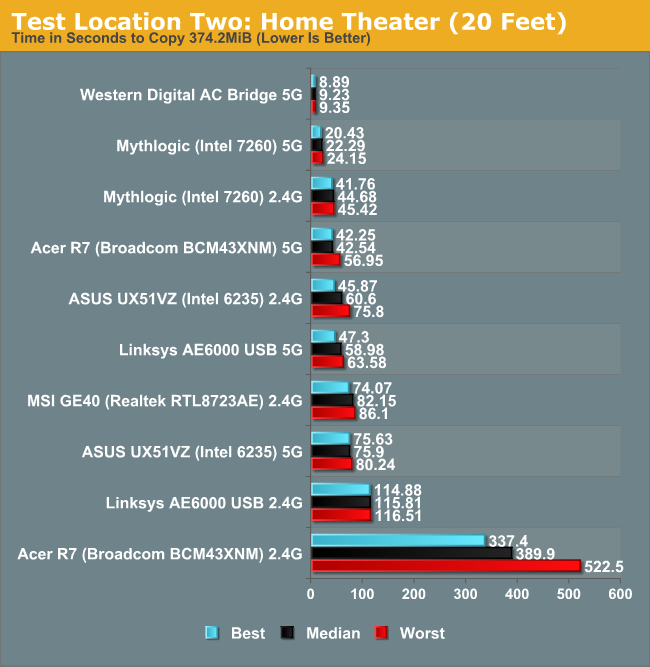 I’m not surprised to see the Mythlogic notebook post excellent throughput over 5GHz 802.11ac, but it ends up being the third fastest solution even when falling back to 2.4GHz 802.11n at the second location! I could live with throughput of 50+ Mbps throughout my home, but pulling over 300Mbps from the downstairs HTPC to my other networked PCs over wireless is simply awesome…as long as the wireless signal doesn’t get dropped. I haven’t actually had that happen with the Western Digital AC1300 (yet), but over the past seven or so years of testing notebooks and laptops for AnandTech, dropped wireless connections are a far too common occurrence in my experience. I’ve been through about ten wireless routers during that time, and even the best were never quite as stable/dependable as wired Ethernet. Some might go a couple weeks or even a month without needing a reboot (e.g. the Amped Wireless), while others might have WiFi "crash" every couple of days. Our current mobile test suite at present weighs in at a hefty 121GiB; over Gigabit Ethernet it takes about 20 minutes to copy everything over. Now imagine a laptop like the MSI GE40, except without the Ethernet port, and I’d be looking at nearly six hours just to copy the testing files over WiFi. (Thank goodness for USB 3.0 external SSD adapters!) But perhaps you never bother with copying large amounts of files over your local network, so slower WiFi speeds aren’t such an issue, right? My Comcast Internet now tops out with downstream speeds of up to 40Mbps and upstream rates of 12Mbps; when I’m not in my office, that means some of the adapters/laptops out there are likely going to bottleneck my Internet speed. It’s not the end of the world when you can only get 25Mbps, but there are certainly times when you’ll notice the difference—particularly if you have multiple PCs accessing the net concurrently. One final item to discuss is that the adapters aren’t the whole story. You can see in the charts above that just because something supports two spatial streams on WiFi doesn’t inherently mean better performance than single stream adapters. The tiny USB WiFi adapter only manages average performance on a 5GHz connection from a couple rooms away from the router, and on a 2.4GHz connection it ends up being the slowest option outside of the Acer R7 2.4GHz result. Better antennas matter, and in the case of the Acer R7, the tuning of the antenna is likely another major factor. The R7 actually fails to detect my 2.4GHz network from 50 feet away, yet it still manages to connect to the 5GHz network, and the R7 isn’t alone in such funky behavior. I’ve had laptops where the WiFi adapter powers off when the system has been running more than about 48 hours straight (even if the WiFi wasn’t doing anything), and the only way to get it back is to turn the adapter off and then turn it back on. And if laptops can sometimes have flaky WiFi implementations, many of the tablets out there are worse—range on two of my Android tablets is probably 50 feet at best before I have problems, so even my driveway is “too far” to get WiFi coverage. - a single 2.69 GB file transferred at 14.2 MB/s (114 Mbps). - 1,223 items totaling 2.93 GB transferred at just about the same speed (13.2 MB/s or 106 Mbps). Netgear may be your problem. I've never had any luck with Netgear routers for myself or any of my customers. Linksys/Cisco seem OK, but the almost exclusive use of Broadcom chips limit them. Atheros makes some really nice chipsets, but they don't have good market penetration in consumer level equipment. What router companies usually fail to mention is that high speed wifi are broken up into multiple streams. the problem with this is that network applications which only make 1 connection, will only use a single stream. This means that in order to reach your full speed, you need to get 3-4 connections going. Then use a download manager such as down them all for firefox. then have it download and compare your speeds. with 802.11ac, speeds quickly drop with distance because it can not maintain something as high as 256QAM for more than a few feet. and generally after about 20 feet, each stream will give around 100-120mbit/s of performance. windows file transfer will often only make 1 connection but depending on the router, different streams can take turns handling a single connection which leads to a small speed boost, but nothing close to a true multi connection. The good thing about the r6300 is that is has very high end wifi radios and they can be heavily optimized so netgear may release more updates to further optimize the wifi, or the community behind tomato or some other open firmware, will implement some of the latest optimizations. PS if just having a slower client connected to the 5GHz network will slow the 5GHz network down or cause the router to drop to an N450 mode, so if you have 1 router set up as a bridge and the main router set up as normal where the second router shows up as a client, then make sure no non ac1300 client is connected to the 5GHz. I do not believe that last part to be true. Ac afaik will stay at ac speeds even with an n device.